Thank you for your interest in Butte Humane Society’s Animal Assisted Wellness Program. We are currently looking for friendly, compassionate, reliable people, with friendly, well-mannered pets that would like to work make a difference in our community. Does NOT have to be adopted from the BHS shelter. Other animals will need to be able to demonstrate that they can walk or be carried calmly. All animals will need to show that they enjoy visiting with strangers, be ok with medical equipment, and complete an evaluation simulating a real-life visit. 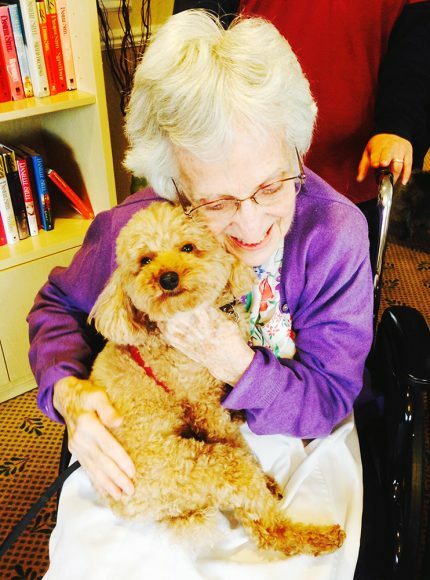 We currently visit a number of nursing homes and assisted living facilities throughout the Chico area as well as work with Butte County Library’s StoryTime Tutors and Meriam Library’smonthly Student De-Stress sessions. You will be asked to purchase a “Paws for People” t-shirt, bandana, and badge so are easily identified. The current fee is $30. If you do not feel as though you have the resources to participate in AAW, there are numerous ways to volunteer at BHS! Check them out at www.buttehumane.org/volunteer. Complete and submit the online AAW Questionnaire. You will be contacted by the AAW Coordinator within a week to schedule an interview & Basic Skills and Temperament Assessment for you and your pet. Attend the interview and Basic Skills/Temperament Assessment with your pet. You will receive the AAW Volunteer Manual and Quiz when your pet successfully completes the assessment. Read the AAW Volunteer Manual and take the quiz. Once you have completed the quiz, you will be scheduled to attend a shadow visit. Shadow the AAW Coordinator or seasoned volunteer team on a visit to a facility (this cane be done more than once.) You can then schedule your Visit Simulation Assessment when you are ready. After successfully passing the VS Assessment, you will be asked to pay the $30 enrollment fee to cover the Paws for People t-shirt, bandana, and badge. At this time, you should also contact your veterinarian so they can complete your Health Certificate. If you do not have a primary veterinarian, the Butte Humane Society Clinic does offer wellness exams. Schedule your Observed Visit with the AAW Coordinator. Once you have completed the visit, you will receive your Welcome Letter and Volgistics credentials to sign up for AAW volunteer opportunities! For questions or more information, please contact our AAW Coordinator at: 530. 343.7917 x 107 or rachelagostino@buttehumane.org. For help with basic obedience or therapy animal training, contact: A Good Dog Day at 530.459.8767 or info@HaveAGoodDogDay.com.